Gish is a Westport native and watercolorist, whose work is in a number of collections, including Dartmouth College and the US. Marine Corps Museum. Gish was a combat artist for the Marine Corps and retired as a colonel. An art department faculty member at Fairfield University for 21 years, he has exhibited widely, including at The Smithsonian Institution, National Gallery, and American Watercolor Society. Peter Michael Gish has been painting since 1945. After graduating from Dartmouth College where he worked with Paul Sample, he studied fresco, drawing and painting in Paris, 1951-1952. Later he continued these studies in Madrid at the Academia Real Bellas Artes. From 1957 – 1958 he attended Oskar Kokoschka’s Sommerakademie in Salzburg, and was Kokoschka’s assistant there in 1959. Following several years as a free lance artist, he entered Yale University where he earned his MFA in painting in 1964. The next summer he was visiting artist at Dartmouth College. In 1967 he served as a combat artist in Vietnam, and more recently with the US Marine Corps in Iraq during Operation Provide Comfort, 1991, and Operation Restore Hope in Somalia – 1992-1993. 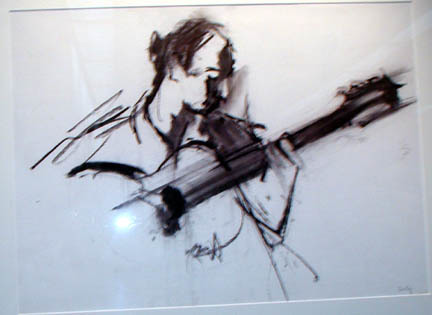 Peter Gish has exhibited his work widely, including shows at the National Academy, The American Watercolor Society, The City Center Gallery, The Kraushaar Gallery and Artzt Gallery in New York and the Smithsonian Institution in Washington, D.C. His work is represented in many private and public collections, including those of Dartmouth College, the Joseph H. Hirshorn collection, the Center for Financial Studies at Fairfield University, and the USMC Historical Museum in Washington, D.C.
Gish, Peter Michael , “Guitar Player,” Westport Public Schools Digital Collections, accessed April 23, 2019, https://collections.westportps.org/items/show/548.